It's an interesting new era for Canada's hemp industry. We're nine years in and companies are, well, seeing green. Not just the green that spreads its serrated leaves across field sections every summer, or the Green that comes with making and selling sustainably produced products (and no, it isn't the green of jealousy) it's the green of money. After a few years of steady growth, the current North American market for hempseed-derived products is now calculated to be about $40 million. Some companies have been consistently growing sales at 50% or more per year. New products continue to hit the shelves and distribution of these new products continue to reaching new retailers. And so for the fifth year running, cultivated acreage of hemp is increasing. Last year's 24,000 licensed acres should be matched or exceeded in 2006. 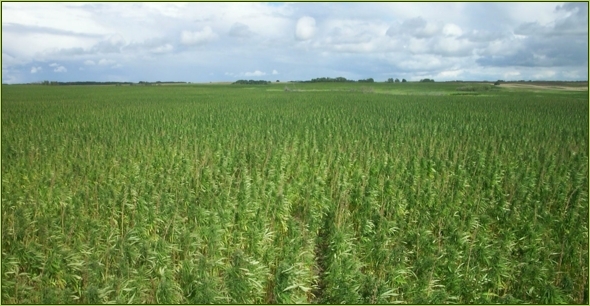 Experienced hemp farmers are increasing acreage to meet processor demand. The proportion of certified organic acres continues to climb. And happily, supplies of certified planting seed have kept pace and new varieties are being developed across the country. Most production remains out West where land and production costs are the cheapest: half of national production is in Manitoba -- Saskatchewan holds about one third. Weak prices of other commodities (most notably flax) and strong prices for hemp are creating a lot of interest in our crop. Farmgate prices are maintaining at generally 45 cents a pound conventional; organic at 85 cents a pound. As hemp prices are set by the dynamics of the free market there is a risk that an increase in speculative production will impact price and, over the longer term, supply stability. For a small, specialised industry such as hemp it's very important for farmers to secure a contract. Gearing production to demand will help maintain prices, allow for a steady supply, and a sustainable expansion of the market. Similarly, excessive overcontracting on the part of buyers will not do the industry any favours. We've been down that road before, and don't want to take that detour again. Yet, there are some signs in the hinterlands that not all is well. 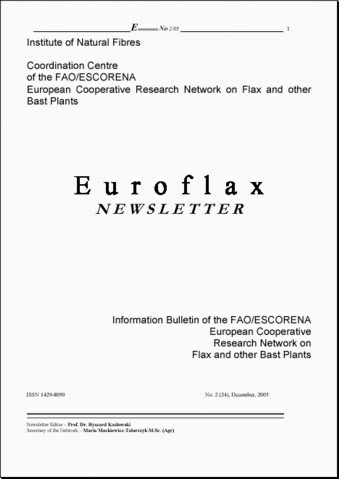 Some farmers who grew conventional hemp grain under contract in 2005 have not been paid. At this juncture, it is unclear whether it's a game of wait and see, or whether their buyers will renege on their commitments. However, producers and processors alike can benefit from export assistance programs such as Saskatchewan's Nextrade, which helps finance sales, and also, mitigate the risk of non-payment. Now, it's reasonable to assume that, over time, increased demand and increased supply will see farmgate prices decline. Adding value by processing fibre, turning what is now an agwaste into another revenue stream, will play a very important role in hemp's future. Currently fibre processing is moving slowly, but definite progress is being made: Ontario's Hempline is an emerging company in technical fibres, while out West, three companies -- Avanti Polymers, Parkland BioFibre, and Naturally Advanced Technologies (formerly Hemptown) -- are taking the necessary steps to implement fibre processing on the prairies. In a few years the fibre sector will be making important contributions to the health of the entire national industry. The Canadian Hemp Trade Alliance (CHTA) has been working on the farm, food, and fibre fronts since 2003. Since beginning with a core of about a dozen food and fibre manufacturers, the association has now grown to include a talented and creative group of over 100 members -- including researchers, farmers, marketers, processors, and entrepreneurs. 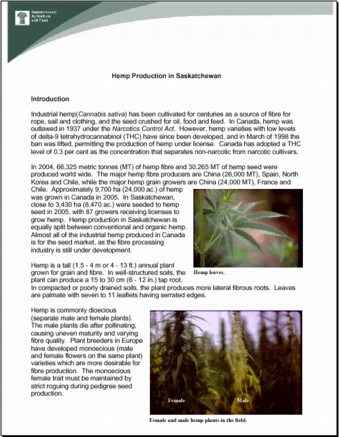 CHTA has also facilitated dozens of media articles about hemp and have responded to thousands of inquiries from the public and professional spheres, ably assisted in all ways by the web sites (www.hemptrade.ca and www.infochanvre.ca). The successful establishment and the growth of the national association reflects the growing confidence, vigour, and profitability of the whole national industry and gives us all a unique tool with which to face the future and so realise the promise that hemp holds for our country. From the baby steps we took in our first, tentative years we seem to be finally hitting our stride. Please note: besides being co-publisher of the Hemp Report, Arthur Hanks is also Executive Director of the Canadian Hemp Alliance.